Voting in Ghana's presidential and parliamentary elections has been extended in many areas where technical glitches led to long delays. Electoral officials say polling in the affected areas will resume on Saturday. Many voters endured long queues before the polls closed at 17:00 GMT. Counting has begun where voting was completed. A tight race is expected between President John Mahama and Nana Akufo-Addo in the new oil producer - one of the world's fastest-growing economies. Mr Mahama took over as president after John Atta Mills died in July. The 2008 election was decided by just 30,000 votes in the run-off. Mr Akufo-Addo, from the then governing New Patriotic Party (NPP), gained most votes in the first round but lost in the run-off. He was praised for peacefully accepting his defeat, in the second peaceful transfer of power since military rule ended in 1992. Mr Mahama's National Democratic Congress is also defending a narrow parliamentary majority. Ghana is seen by many observers as model for democracy in Africa. The BBC's David Amanor in Accra says concerns have been raised that some polling stations failed to process a single vote five hours after officially opening. Others experienced very slow-moving queues and this agitated voters, some of whom stood or sat in line since before dawn, but voting was peaceful, he says. The delays are being blamed on late arrival of officials, the absence of polling materials in some constituencies, and some technical problems with a new biometric registration system. The streets of the capital were virtually empty, with only a few motorists. There were long queues of voters at most polling centres. Many people arrived a 0300 - five hours before voting began. Enthusiasm and passion could be seen in the eyes of voters as they chatted, giggled and watched the voting process with vigilance - some shouted at people who attempted to by-pass the queue to vote. Some secured their place in the line using objects such as chickens, chairs and plastic containers to represent their position. There were a few hitches with voting in some polling centres starting up to three hours late, prompting anxiety among the expectant voters. On Friday evening, electoral commission spokesman Christian Owusu-Parry told local radio: "Voting will continue tomorrow (Saturday) so that these people will have the opportunity to cast their ballots." Despite the delay, local Ghanaian observers said no serious incidents were reported. 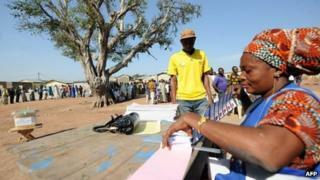 In one polling station in Accra, prayers for peace were held before voting began, Reuters news agency reports. "We are proud of Ghana and hope that whoever wins will win without complications," said Haruni Safiyu, a 26-year-old labourer just before casting his ballot. A special website, Ghana Votes, has been set up to report any problems such as fraud or violence. Whoever wins will oversee the continued oil-fuelled spending boom in the coming years. Both candidates have promised to use the money to improve education provision. Mr Mahama is expected to do well in his home area in the north, while Mr Akufo-Addo draws much of his support from urban areas and the eastern Ashanti region. The NPP candidate is the son of a former president but denies that his privileged background means he does not care about the poor in a country where the average income remains less than $4 (£3) a day. On Thursday, electoral commission head Kwadwo Afari-Gyan told the BBC that the biometric fingerprinting system had been extensively tested over two months and again earlier this week, when security personnel voted. Some 14 million people were registered to vote in 26,000 polling stations nationwide. Both Mr Mahama and Mr Akufo-Addo have promised to accept the result, but 5,000 soldiers have been put on standby just in case. A run-off will be held on 28 December if no candidate wins more than 50%. There are six other presidential contenders and hundreds of candidates for the 275 parliamentary seats.